, to whom this country owes the introduction of printing, was born in Kent in the Weald, probably about the year 1412, but nothing is known with certainty of the date of his birth. His father, William Caxton, who resided with him at Westminster when he was in the height of his business there, must have lived to a good old age, as his death is placed in 1480. 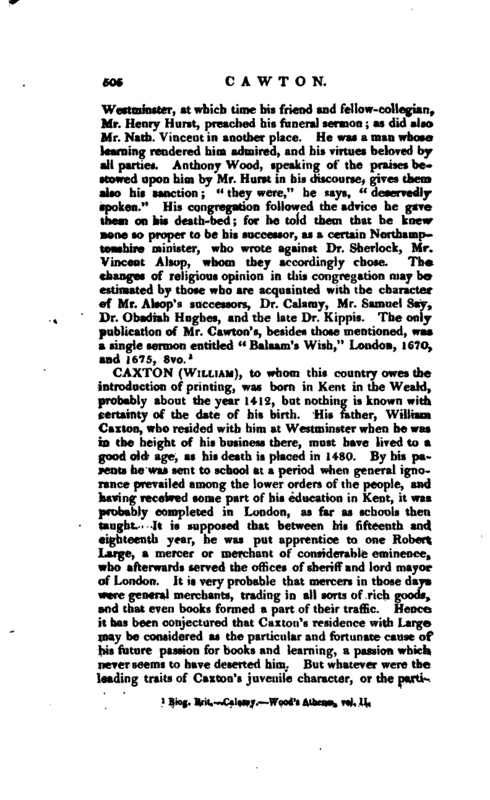 By his parents he was sent to school at a period when general ignorance prevailed among the lower orders of the people, and having received some part of his education in Kent, it was probably completed in London, as far as schools then taught It is supposed that between his fifteenth and eighteenth year, he was put apprentice to one Robert Large, a mercer or merchant of considerable eminence, who afterwards served the offices of sheriff and lord mayor of London. It is very probable that mercers in those days were general merchants, trading in all sorts of rich goods, and that even books formed a part of their traffic. Hence it has been conjectured that Caxton’s residence with Large may be considered as the particular and fortunate cause of his future passion for books and learning, a passion which never seems to have deserted him. But whatever were the leading traits of Caxton’s juvenile character, or the | particular objects of his pursuit, it appears that he conducted himself entirely to his master’s satisfaction, for on the decease of the latter in 1441, Caxton was remembered in his will by a legacy of twenty marks, a considerable sum in those days. Caxton at this time had become a freeman of the company of Mercers, but on his master’s death does not appear to have continued on the same spot. His knowledge of business, however, induced him, either upon his own account, or as agent for some merchants, to travel to the Low Countries for a short time. In 14G4 we find him joined in a commission with one Richard Whitehill, “to continue and confirm a treaty of trade and commerce between Edward IV. and Philip duke of Burgundy,” or, if they found it necessary, to make a new one: and the commission gives both or either of them, full power to transact and conclude the same. They are also styled “ambassadors and special deputies.” Of the issue of this we have no account, but the commission itself is a sufficient proof that Caxton had acquired a reputation for knowledge of business. 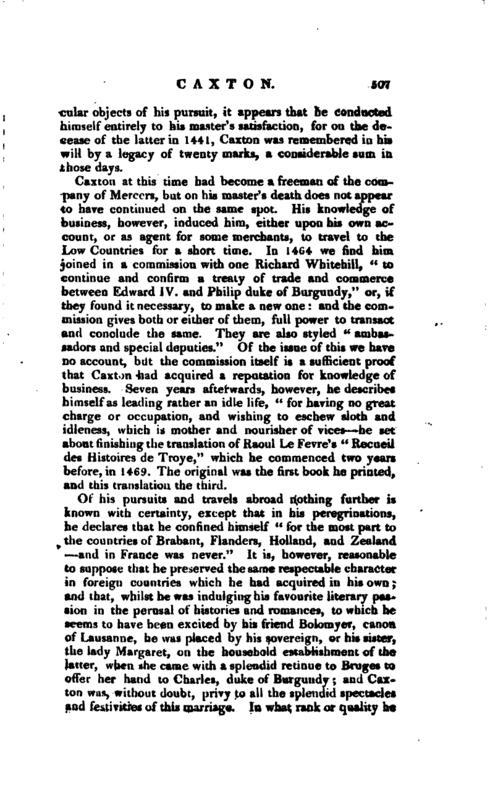 Seven years afterwards, however, he describes himself as leading rather an idle life, “for having no great charge or occupation, and wishing to eschew sloth” and idleness, which is mother and nourisher of vices he set about finishing the translation of Raoul Le Fevre’s “Recueil des Histoires de Troye,” which he commenced two years before, in 1469. The original was the first book he printed, and this translation the third. Of his pursuits and travels abroad nothing further is known with certainty, except that in his peregrinations, he declares that he confined himself “for the most part to the countries of Brabant, Flanders, Holland, and Zealand and in France was never.” It is, however, reasonable to suppose that he preserved the same respectable character in foreign countries which he had acquired in his own; and that, whilst he was indulging his favourite literary pas* sion in the perusal of histories and romances, to which he seems to have been excited by his friend Bolomyer, canon of Lausanne, he was placed by his sovereign, or his sister, the lady Margaret, on the household establishment of the Jatter, when she came with a splendid retinue to Bruges to offer her hand to Charles, duke of Burgundy; and Caxton was, without doubt, privy to all the splendid spectacles and festivities of this marriage. In what rank or Duality he | served the duchess is not known; but the freedom with which she used Mr. Caxton, in finding fault with his English, and ordering him to correct it, &c. seems to shew that the place he had in her grace’s family was no mean or ordinary one. 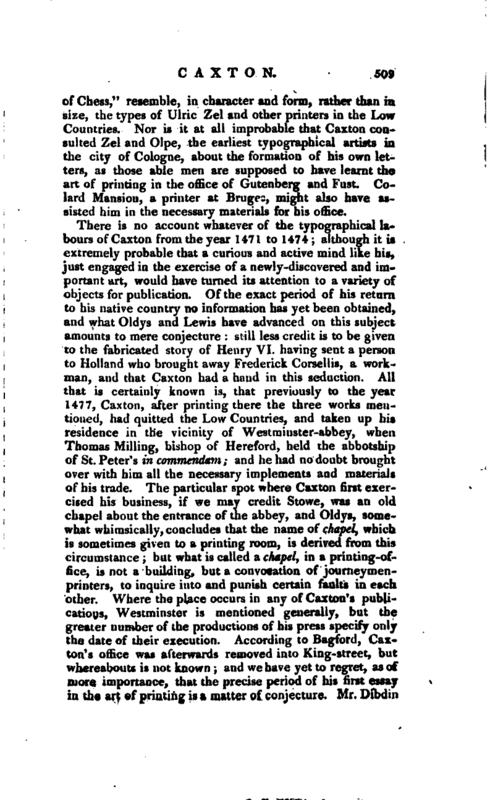 Lewis and Oldys, in Mr. Dibdiu’.s opinion, are incorrect in saying that he was employed by the duchess to translate into English Kaoul Le Fevre’s French History of Troy t the fact was, that Caxton had commenced the translation voluntarily, without her knowledge, and had proceeded as far as five or six quires when he for some reason gave it up. About this time, having mentioned to Jady Margaret the progress he had made, she desired to see his manuscript, and it was on this occasion that she found fault with his English, but commanded him at the same time to finish the translation, and amply rewarded him on the completion of it. 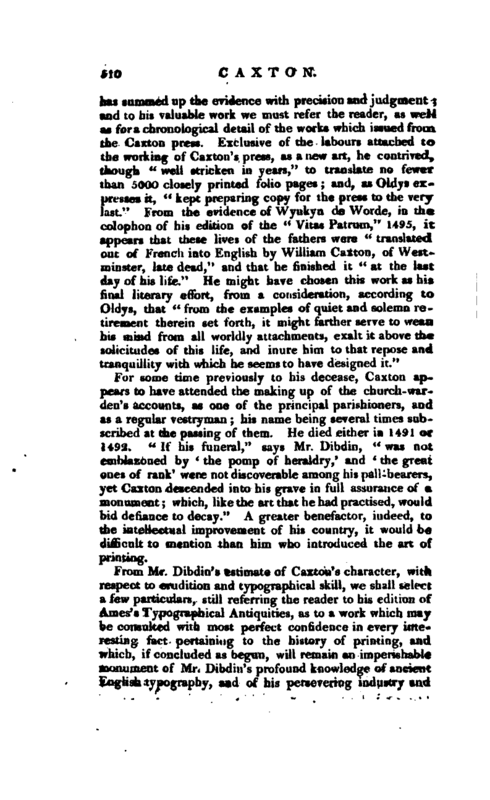 From the prologues and epilogues of this work we learn several particulars of the author, as that, at the time of finishing the performance, iiis eyes “were dimmed with over-much looking on the white paper; that his courage was not so prone and ready to labour as it had been; and that age was creeping on him daily, and enfeebling all his body: that he had practised and learnt, at his great charge and expense, to ordain this said book in print, after the manner and form as v.e there see it: and that it was not written with pen and ink as other books be.” Hence we discover that he was now adyanced in years, and that he had learnt to exercise the art of printing, but by what steps he had acquired this knowledge his biographers have not been able to discover. It appears, as already noticed, that the original of Ilaonl’s Trojan History was the first book Caxton printed: “The Oration of John llussel on Charles duke of Burgundy being created a Knight of the Garter,” was the second, and Caxton’s translation of Raoul, the third; and this third was most probably printed in 1471. 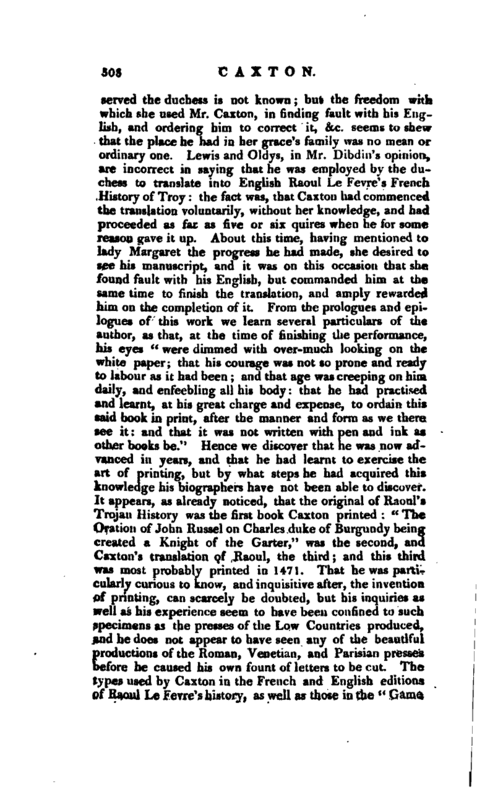 That he was particularly curious to know, and inquisitive after, the invention of printing, can scarcely be doubted, but his inquiries as well as his experience seem to have been con lined to such specimens as the presses of the Low Countries produced, and he does not appear to have seen any of the beautiful productions of the Roman, Venetian, and Parisian presses before he caused his own fount of letters to be cut. The types used by Caxion in the French and English editions of Raoul Le Fevre’s history, as well as those in the “Game | of Chess,” resemble, in character and form, rather than in size, the types of Ulric Zel and other printers in the Low Countries. Nor is it at all improbable that Caxton consulted Zel and Olpe, the earliest typographical artists in the city of Cologne, about the formation of his own letters, as those able men are supposed to have learnt the art of printing in the office of Gutenberg and Fust. Colard Mansion, a printer at Bruges, might also have assisted him in the necessary materials for his office. For some time previously to his decease, Caxton appear? to have attended the making up of the church-warden’s accounts, as one of the principal parishioners, and as a -egular vestryman; his name being several times subscribed at the passing of them. He died either ia 1491 or 1492 “If his funeral,” says Mr. Dibdin, “was not embhzoned by ‘ the pomp of heraldry,’ and * the great ones Df rank‘ were not discoverable among his pall-bearers, yet Caxton descended into his grave in full assurance of a monunent; which, like the art that he had practised, would bid defiance to decay.” A greater benefactor, indeed, to the in:ellectual improvement of his country, it would be difficult to mention than him who introduced the art of printing. 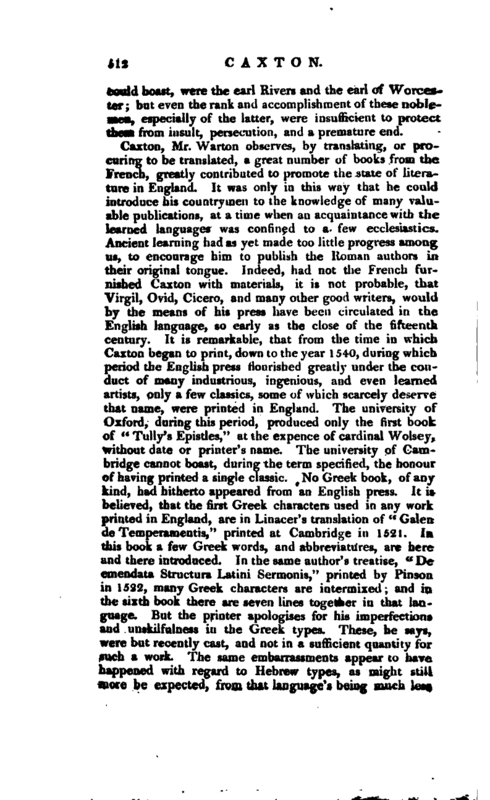 Fron Mr. Dibdin’s estimate of Caxton’s character, with respect to erudition and typographical skill, we shall select a few particulars, still referring the reader to his edition of Ames’s Typographical Antiquities, as to a work which may be consulted with most perfect eonfi lence in every interesting fact pertaining to the history of printing, and which, if concluded as begun, will remain an imperishable monument of Mr. Dibdin’ s profound k no-.ledge of ancient English typography, and of his persevering industry and | skill in furnishing the most ample information that can now be procured. The erudition of Caxton appears to be deserving of better treatment than Bale and others have bestowed upon it. That he had a far greater claim to intellectual reputation than that of possessing the mere negative excellence of “not being downright stupid or slothful,” (Bale’s words,) must be allowed by the most fastidious reader of his numerous prologues and translations. That he was not a poet, however, must be conceded, for nothing can be more barbarous than the couplets for which he has been admitted, by Ritson, into the list of English poets. At the same time, whoever reads his criticism upon Chaucer, must not only allow that he was a better judge, than writer, of poetry; but that it will be difficult to find a criticism upon our venerable bard, in the whole compass of our language, which is more sober and just; more clearly and forcibly expressed. 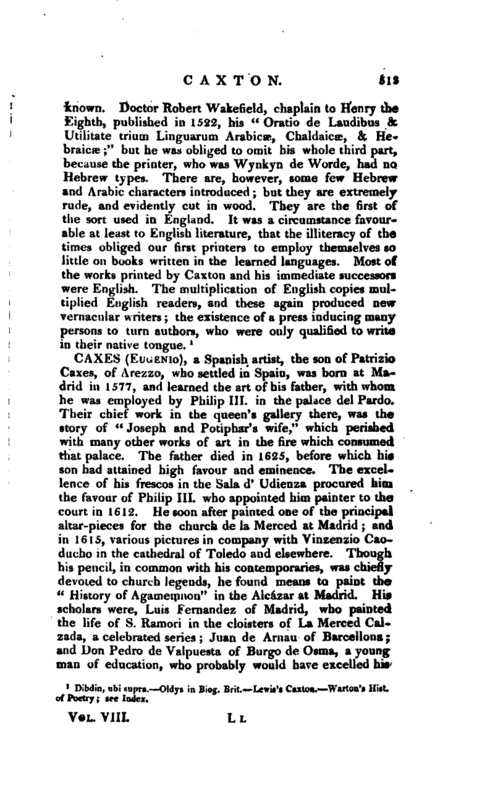 As to Caxton’s knowledge of languages, that seems to have been extremely creditable to him; for he was, in all probability, a complete master of the Dutch, German, and French, and considering his long absence from England (in the prime of his life), he wrote his own language with fluency, simplicity, and occasional melody and force. 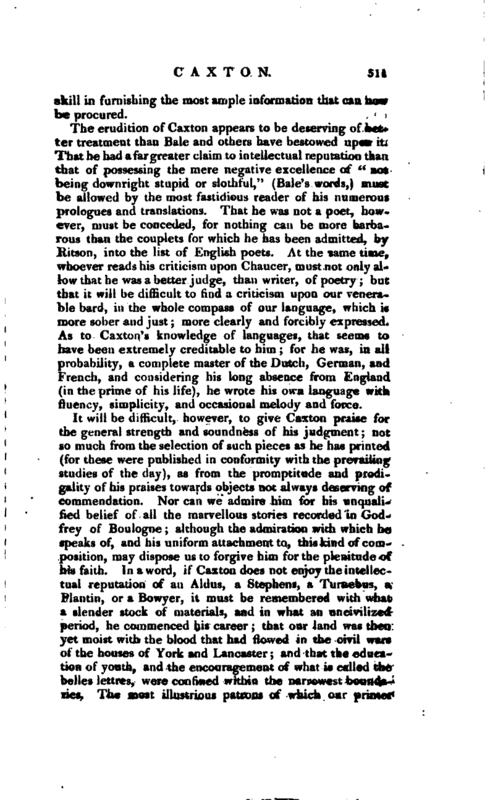 It will be difficult, however, to give Caxton praise for the general strength and soundness of his judgment; not so much from the selection of such pieces as he has printed (for these were published in conformity with the prevailing studies of the day), as from the promptitude and prodigality of his praises towards objects not always deserving of commendation. Nor can we admire him for his unqualified belief of all the marvellous stones recorded in Godfrey of Boulogne; although the admiration with which he speaks of, and his uniform attachment to, this kind of com* position, may dispose us to forgive him for the plenitude of his faith. In a word, if Caxton does not enjoy the intellectual reputation of an Aldus, a Stephens, a Turnebus, a Plantin, or a Bowyer, it must be remembered with what a slender stock of materials, and in what an uncivilized period, he commenced his career; that our land was then yet moist with the blood that had flowed in the civil wars of the houses of York and Lancaster; and that the education of youth, and the encouragement of what is called the belles lettres, were confined within the narrowest boundaries. The most illustrious patrons of which our printer | could boast, were the earl Rivers and the earl of Worcester; but even the rank and accomplishment of these noblemen, especially of the latter, were insufficient to protect them from insult, persecution, and a premature end.